At Cavalia, we care for over 100 horses 24 hours per day, 7 days per week, 52 weeks per year. HOW DO WE CARE FOR OUR HORSES? The well-being of the horses is the top priority of Cavalia and Odysseo, and this is apparent during each and every show, on and off stage. The horses find pleasure in being on stage and we allow them to express their natural tendency to play. A team of 20 people, including a stable manager, two veterinary technicians, a farrier and several grooms, takes care of the horses’ well-being. Together they provide a balanced and personalized diet, a training program, care for their mane, tails, hooves, etc. 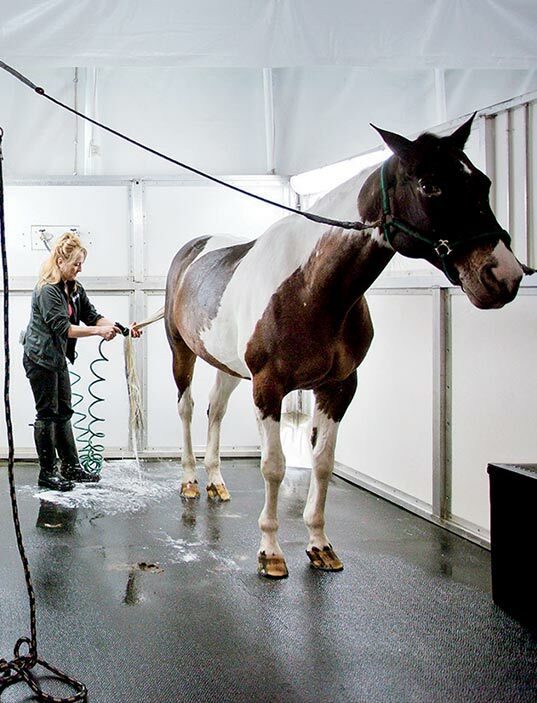 Every day horses get their share of pampering, including a shower, grooming, massage, outings to the paddocks and workshops with their riders. The horses each have a designated box with ample space to stretch, lie down, sprawl out, roll and relax. They always have the same neighbors to ensure a familiar and comforting environment in each city. How are the horses trained? There is a real bond and communication between the trainers and the horses. Talking, using finger and body gestures, and clucking their tongues, the trainers make a game out of the routines. This approach is more time-intensive than other methods, but it generates better results. How long does it take a horse to learn its part? Training a horse for Cavalia and Odysseo can take anywhere from six months to ten years depending on the discipline practiced. For Trick Riding, if the horse is not too apprehensive at the start, the training can be done in a few months. For a horse in Haute École dressage or dressage at liberty, the work can take several years. How many shows does each horse perform per week? The rhythm of life at Cavalia and Odysseo is based on the horses. We mount a maximum of seven shows per week and each horse has a standing. This allows us to give the horses a few days or weeks off as needed, while maintaining the quality of performances. More than 65 horses live in our stables. About forty of them perform regularly in the show, while the others are used on a rotating basis or are still in training. When the show moves from one city to the next, the horses go on “vacation”. At their retreat, the horses are surrounded by spacious paddocks, where they can bathe in the sun, roll in the mud, rest and gaze. Do the horses always perform according to plan? The stage is a big playground for our four-legged stars. Even if they have a choreographed routine to follow, they are given the latitude to express themselves. The strong communication established between the trainers and their horses allows them to understand each horse’s talents and needs as well as to help the horses perform at their best even when they choose to deviate from the exact plan. How are the horses transported? For journeys of a few hours, the horses travel in several trailers specially fitted for them and which are equipped with surveillance cameras. When long distance travel is required, the horses travel by air onboard a dedicated chartered aircraft, in which case they are accompanied by a transport team and a veterinarian.